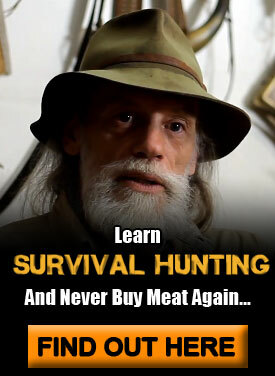 In all seriousness though, the more experience you can get in making/hunting/foraging for your own food the more thriving and the less surviving you’ll be doing if things ever get as bad as some think they might get; and having maple syrup is one of those things that could really be a morale booster in tough times. 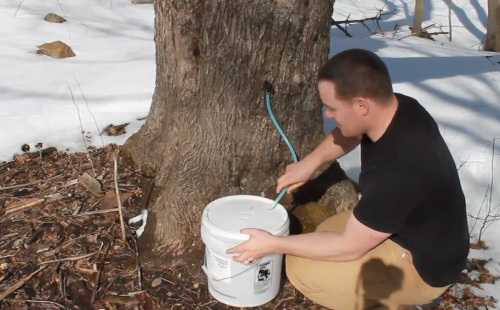 Making your own maple syrup is actually a very simple process. Even though (at the writing of this article) the syrup season is winding down, I would recommend getting the equipment ahead of time so that you have it when you need it. Step 1: Drill a hole about 2 inches deep that is slightly smaller in diameter than your tap. 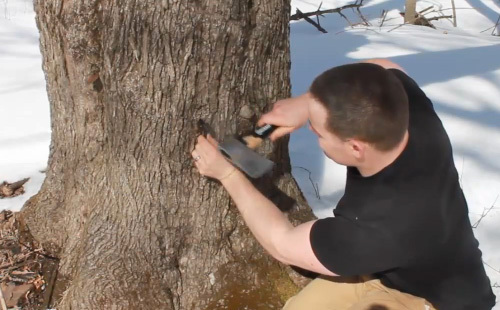 You’ll want to drill at a slight upward angle and on the south facing side of the tree. Step 2: Hammer in your taps or “spiles”. If tapped in correctly, you should see sap dripping from it. Step 3: Attach container to your tap. If you’re using a hose/tap combination like I use, then just run the tubing into the container (I drilled a hole in the container’s lid to easily feed the tube through). Otherwise, hang a container using the hook/spile method. 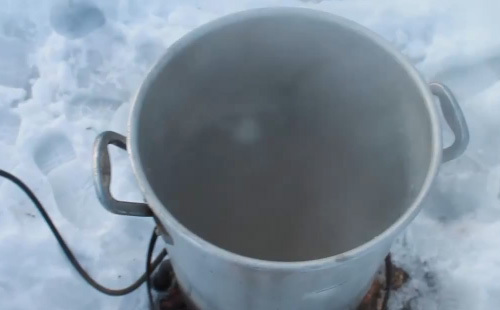 Step 4: Start to boil your sap down. I typically process my sap 10 gallons at a time. 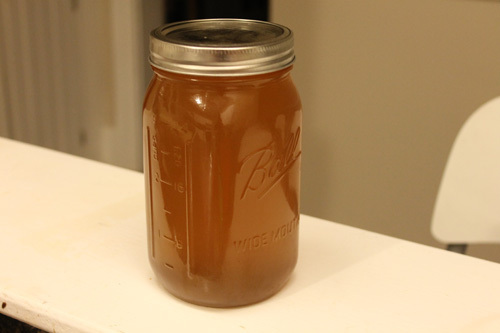 10 gallons of maple sap will make around 1 quart of syrup. I’ll boil the sap outside until it is about 1/2 to 1 gallon left. 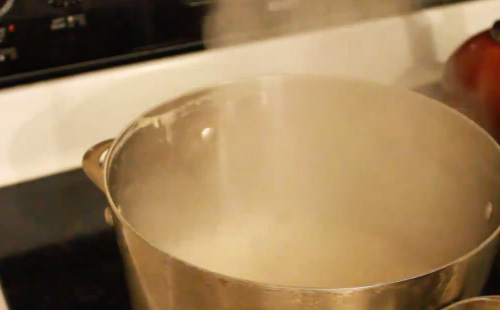 Step 5: Stop processing once syrup reaches 7°F over your boiling point. At sea-level where I live, the boiling point of water is 212°F. If you’re at a higher altitude you’ll want to measure with a thermometer what the temp is when the sap is boiling. At this step, just add 7°F to whatever that temp is. Step 6: Filter syrup into a canning jar. Step 7: Store away and enjoy! 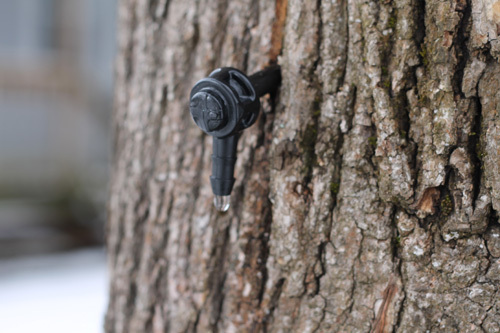 As a general rule, once you have warmer day-time temperatures but still cooler nights, you’ll start to get good sap flow. The best flow comes when the temps reach below freezing at night and above freezing during the day. Where I live in the Northeast that tends to be around late February early March through about April. You can keep the tap on the trees until the buds start to form on the branches. 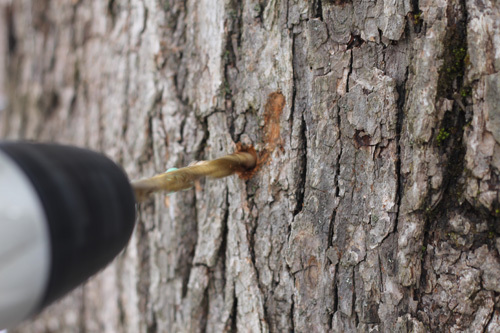 Once the buds form, the sap will become “bitter” resulting in an inferior end product. What do the various grades of syrup mean? You’ve probably noticed the various grades of syrup you can buy from the store (ie Grade A or Grade B are the most common here in the U.S.). The grades are basically a judge of darkness and clarity. Grade A tends to be lighter colored and doesn’t have as strong a maple flavor whereas Grade Bs have a darker color and stronger taste. How do you make different grades of syrup? 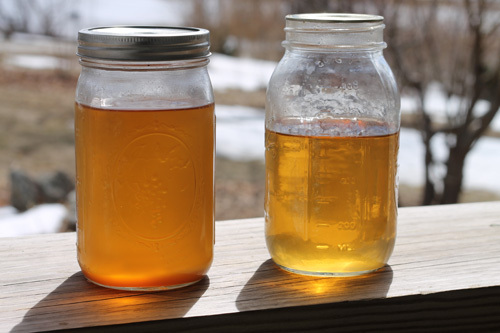 In reality, you really don’t have control over what grades of syrup you can make since it varies year to year. As a general rule though, the earlier in the season you make it, the lighter the syrup tends to be. Yes, maple syrup is definitely a treat….but you can figure on only about a 50:1 yeild. So to yeild 1 quart (32 oz.) 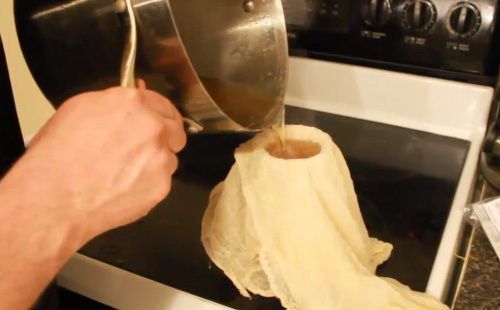 you will need to cook down 12.5 gallons of maple water. It’s a long process, but well worth it. 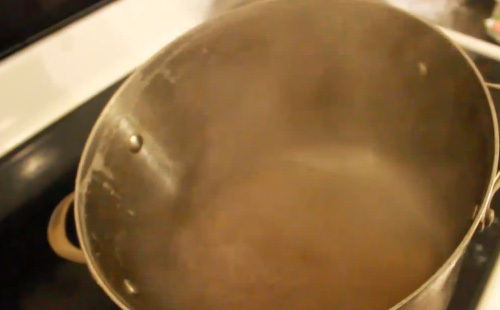 Remember to always boil syrup outdoors or the steam will leave your walls sticky. Has anyone tried to cook down the syrup in a crockpot? Granted, it would be a tiny amount for each batch, but it would be great for when you had to leave the house. As to the ratios of sap to syrup, the Mo Dept of Conservation states 40 to1 for maple and up to 80 to 1 for black walnut. It’s worth a try and yes 40:1 has been closer to my experience. 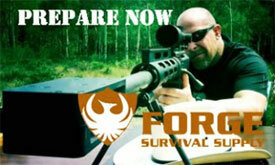 I also meant to say nice article and job on the video! 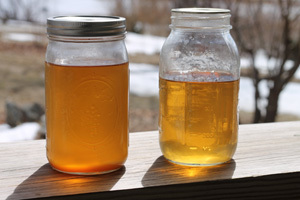 I think the best part of making maple syrup yourself would have to be that you can make it as thick or thin as you want. Yum. And if you continue the boiling process (watching carefully) you’ll have maple sugar; a huge treat all we kids looked forward to when we were making syrup in the spring. Yum! In the Pacific NW, I understand that the indigenous Yellow Maple can also be tapped for syrup — never tried the syrup so can’t say anything about how it compares. 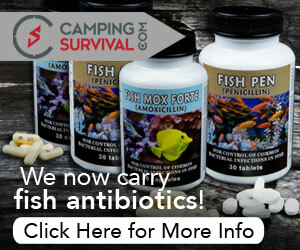 fantastic publish,very informative. I’m wondering why the other specialists off this sector do not notikce this. You shouldd proceed your writing. I am sure, you have a huge readers’ bbase already!